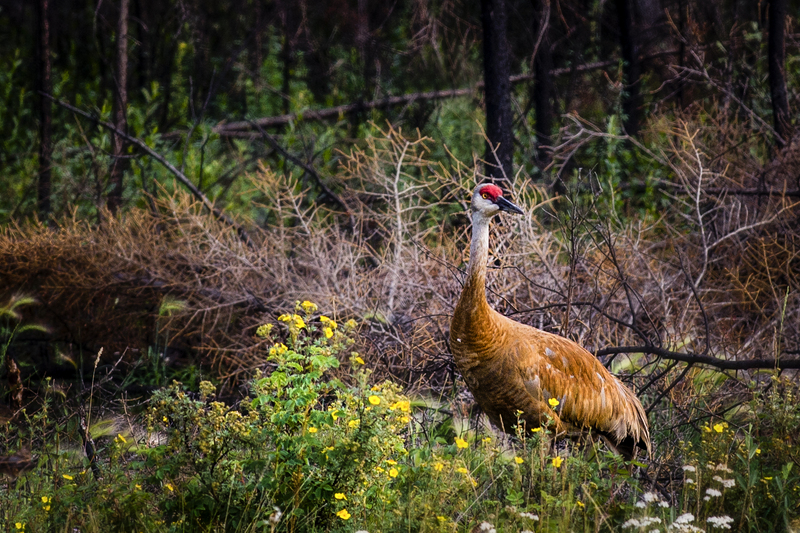 Sandhill cranes nest in the wetlands of the Northwest Territories before beginning their trek south for the winter. 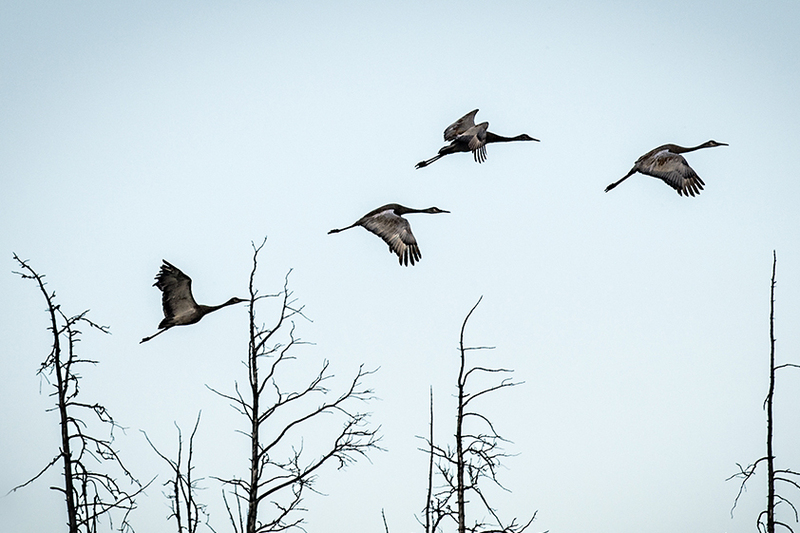 Mated pairs of sandhill cranes stay together year round, and migrate south as a group with their offspring. Both males and females incubate the eggs. Their calls are unique — they give loud, rattling bugle calls, each lasting a couple of seconds and often strung together — and can be heard up to 2.5 miles away. 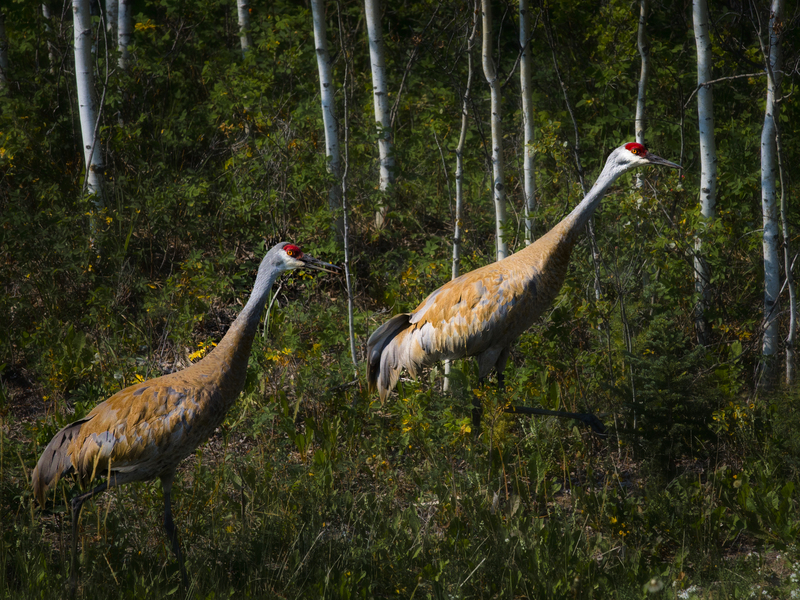 These cranes have a large wingspan, typically 1.65 to 2.29 m (5 ft 5 in to 7 ft 6 in), which make them very skilled soaring birds, similar in style to hawks and eagles. These are fabulous shots, Sherry! When we lived in California, we went several times to a bird preserve near our home. They have a festival every year welcoming the sandhills who migrate there. I’ve also seen them at Yellowstone a few times. But I never managed to get that close to them- you got some amazing photos! What beautiful colors on those cranes and a lovely poem. Thank you, Laurie! I am a bit out of my depth with wildlife photography — and my lenses are too short — but I certainly enjoyed having the opportunity to see and hear these unique birds. Lovely! And the poem you’ve chosen to go with your images is great too. I had never seen these beautiful birds until 2011, when we were cruising on the Central Coast of BC. We saw them a couple of times, on the outer islands – probably starting their southward migration. Very impressive, and those calls…they’re definitely something you don’t forget. COOL! These guys are all over the area here. Very bold, frequently causing traffic jams by walking in the roadway. I’ll try to get a picture of them attacking Virgil: if they’re on the golf course when he goes out, they start honking and walking toward him very aggressively. He stands his ground till they get quite close then creeps back to the safety of the house pretending he had intended to go back all the while!